In New York, deck installation is one of the best ways to create extra living space and an area designed solely for your enjoyment and relaxation. After a long day traveling to, from, and about the city, most homeowners covet a place to kick off their shoes and call it a day. Without accessories such as outdoors heaters, misting systems, and a cover, decks may only serve this function for part of the year. Still, there is hardly a more cost-effective way to increase the livable space of your home. The debate between natural wood and synthetic decking is one that has been raging for several years among decking contractors with no immediate end in sight. You should know that just because decking is made from synthetic materials doesn't make it impervious to the elements such as rain, sun, heat, cold, and other weathering factors. In fact, most New York deck builders will recommend wood for superior performance. Where synthetic decking really shines is in the ease of installation. Manufactured to exact specifications, synthetic decking can be literally snapped together in a fraction of the time that it takes wood decking. Even if you end up hiring a professional to build your deck, the cost of installation should be considerably less. On the other hand, both life expectancy and design options may be somewhat limited by synthetic materials. Just like different species of wood, there is a wide range in the quality of different synthetics, so be sure you know what you're getting before you make a final decision. As projects can range from small, single-tier decks to large, multi-tiered decks with stairs, the cost of deck installation in New York is equally various. The average cost of building a deck is about $7,500, but we've seen recent projects range from as little as $1,500 and as much as $13,000. A truly custom-made, luxurious deck can cost upwards of $20,000. 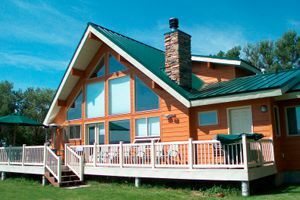 Often, plans can be scaled back to meet your budgetary constraints, or you can finance the project through a lending institution or directly through your New York deck builder. Of course, as with any major home improvement project, you can expect some of the cost to be recouped in additional property value. Recent data suggests you might see a return of 90 to 95 percent of the cost of your deck installation. This means if you spend $7,500 on a new deck, the value of your home will jump by about $7,000. Plus, a deck is a great selling point in general when it comes time to sell your home. There's never a bad time in the process to begin looking for a New York deck builder. Whether you have every last specification ready to go or want to discuss your options with a professional, we can help you find a reliable, quality New York deck builder. The best contractors are in high demand, so it may take a little time for the project to begin, another good reason to look early for the person or company who is going to build your deck. HomeAdvisor puts each and every contractor through a rigorous 10-step screening process. Here is some advice pulled from our online customer ratings and reviews. You can use this online information to see what other New York homeowners have thought about their experience, both good and bad, with individual contractors. "Choose your contractor not only by references, but by gut feeling when you meet them. We had a really good feeling about Aaron when he met us at our house the first night. After meeting with him and other contractors, we had the best feeling about him and I am very glad we went with his company." "I provided a sketch of what it should look like therefore they knew exactly what I wanted." Comment: I have a large outdoor wooden terrace that needs to be sealed. It was already power-washed, but I now need it sealed. I also have some wooden end tables and furniture that is in need of a bit of care. Comment: We have a rooftop deck but the floor is concrete tiles and because of the drainage hall in the center, the floor is slanted to let water flow in that direction. I would like a good looking or decent deck with better flooring that is even. Comment: Add a deck and entrance from parlor level in the back of a townhouse. And demo stoop in front of townhouse and replace with metal stairs. Comment: 3 concrete balconies (5th-7th floor) roughly 45sq ft each need sealing preferably with a system like Treco. Comment: I'm the board president of a 7-story condo in Manhattan. We have a large wood (pine?) roof deck that has been neglected. We'd like someone experienced to resurrect it (clean, sand, stain, and seal). It measures approximately 750 sq. ft. Comment: Clean my terrace after a winter of water and grime - about 16 ft. by 9 ft.
New York Deck Builders are rated 4.66 out of 5 based on 815 reviews of 45 pros. Not Looking for Decks Contractors in New York, NY?